The chapter starts in the middle of the fight between Joe and Mikio, the second round is up and living, although the same cannot be said about Joe who is not having the time of his life! The gear that Mikio is using, Ace, has been improved and now it doesn´t only detect the gear´s movement; but the ones from the muscles too! Joe changes his fighting tactics and starts utilizing other moves that are able to somewhat take Mikio by surprise; still his Gear is smart enough and can learn those movements after seeing it just once! Mikio is able to put Joe on the floor! The fight continues and Joe is still unable to make any real damage to his opponent. Mikio tells him that no matter what tactics and tricks he does, because he and his people are still pathetic losers; that pushed JD´s buttons, who gets up and tries to attack again, Mikio then makes him slip and tells him that he is just an Stray Dog, nothing else. Suddenly the round comes to an end! Meanwhile Yukiko and Yuri are watching the match, and the leader of the Shirato group is ready to leave, until Yuri stops her and tells her that if she wanted to see who the real deal is, she must stay and watch… Yukiko hears his words and stays. Joe is getting ready for the next round, while Mikio does the same; on the side of JD Pops and him are talking (plus that our Hero has lost a tooth) and Nanbu is saying that since Mikio´s Gear can read movements, if they don´t find any weakness then they are out of options, still Joe remembers Pops about what he said, that Gear doesn´t make a Boxer. Meanwhile Mikio is with his team and it seems everything is going fine with the Gear right now, still Mikio scolds them and tells them to not say their opinions, only the numbers, is all that he needs. Meanwhile Yukiko and Yuri are talking and Yuri explains to the Shirato president that the Gear Ace that Mikio is using puts a heavy strain in both the mind and body, so the longer the fight is or the harder it is, it will get worse for Mikio; Yukiko says that using a gear that no one is able to use is foolish, and that´s why he wasn´t entrusted with the Shirato Group. Meanwhile Shirato is remembering and his intentions in showing why he should have been chosen as the head of Shirato. He remembers his training and the strain it puts on him, still he won´t give up on his baby! The Gear Ace! Back to the match, Mikio and Joe starts sharing punches one against the other, still Mikio, thanks to his Gear, is still not hurt by any of the attacks made by Junk Dog! The attacks of Mikio continue and JD only can blocks it! Mikio mocks Joe and tells him that he is a fraud and only bluffed his way until this moment! Joe then says that with that kind of punches he won´t be able to reveal that he is the real deal; those words annoyed Mikio who starts attacking even more, making our Hero fall of the ring; Sachio wanted to help him but Pops stopped him since if he touches it, it would be disqualification! One day when Yuri was going to train in the night, he saw Mikio training, so he decided to leave; Mikio stopped him and asked him why he left the Ace project and joined that Integrated Gear stuff? Is he loyal to Yukiko? Yuri says that he just choose the winner option; Mikio then challenges him to a fight and see what gear is the best! Since he is just a wild animal that has cozied up with Shirato! Yuri then throws a punch that doesn´t reach Mikio; but made him bloc. Yuri asks… Who did that? Mikio or Ace? Mikio says “Ace”. Back with the fight, Mikio is still wiping the floor with Joe while the Shirato person tells him that he will never approve that JD is the real deal! Joe suddenly embraces him and tells him that his name is Joe! JOE!! Mikio throws him and since both movements are illegal; both fighters have a fault, other one and they will be disqualified. The match restarts and Mikio is ready to keep going… Until he sees that Joe doesn´t have a fighting position, seeing that he is open Mikio attacks! But Ace stops him, making him only do some not so strong moves, which are easily avoided by Joe until the round comes to an end. Joe then explain to his team that he was testing something…That if the Gear doesn´t detect a battle pose it goes weird and doesn´t make the user do what he wanted to do… Now he has found the weakness of that Gear! Meanwhile Mikio and his team has detected the same thing, and his team advises him to shut off the assistant; but Mikio forbids them to do that! Ace is him, and Mikio is Ace! The next round starts and Joe has a plan! A counter. Mikio thends to hit with the right, so he must wait for the opportunity when he moves, then Joe has to evade and suddenly make the attack while standing in a no fighting position! The attack comes and Mikio, as Pops planned, wen to attack with his right hand! 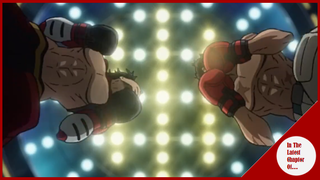 Still in the last moment he changes to a left punch; Joe, following his instincts, receives the attack while at the same time attacks Mikio with the uppercut on the chin! Mikio kisses the floor and the count reaches 10! Joe has won! Joe is going to Megalonia and the people goes crazy! Mikio gets up and ask him how he knew he changed his movement? Joe says that he just followed his gut… Just Like Mikio did when he changed his punch from right to left, after that Mikio leaves and recognizes Joe´s victory. Joe then looks at Yuri and he still remember the promise, to go and chase him on his ring! After the match, Mikio is driving while it seems he has a lot of things to think about. Meanwhile the celebration in Team nowhere house starts! Everyone is celebrating while Joe is trying to sleep, although he has a lot of pain right now! But still he has made it to Megalonia and is ready to face Yuri and any other opponent! Oh Boy!! This chapter didn´t disappoint!! Loved everything about this, the fight, the parts in between, everything! Man the fight was quite good, I was at the verge of my seat the whole time! The rhythm of the fight was quite good while at the same time it present us in a good fashion the whole thing of Mikio´s gear plus his decisions. In another point, although still related to Mikio, I liked how was his interactions with Yuri, and about the stuff with his gear; plus in the end, and even more when Yuri spoke about it, one can respect Mikio, even if he is a royal A-hole, the guy still has guts and everything that makes him the real deal. Other point is in how Mikio took his loose, of course now he has things to think; but I think he leaved, not in shame; but proud, he did a good fight and he has nothing to be ashamed of for it. Now finally, it seems that Pops made a deal with Fujimaki, which gives more contexts on what the gang boss said in the past chapter, and I am not surprised on this turn around… I mean I am intrigued in what shady deal they have; but it´s a movement expected of the Nanbu we knew on the first chapters of the series, still we will see how Joe, Sachio and surely Pops will have to deal with this thing!